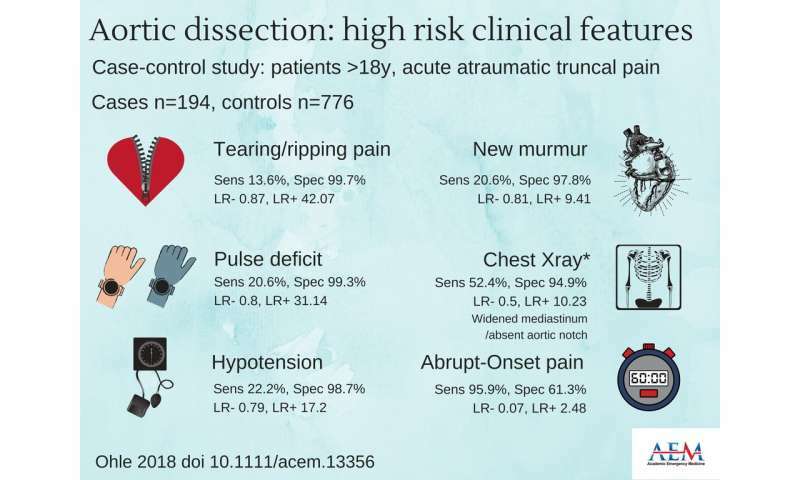 Aortic dissection: high-risk clinical features. Credit: Kirsty Challen, B.Sc., MBChB, MRes, Ph.D., Lancashire Teaching Hospitals, United Kingdom. Patients with one or more high-risk clinical features (tearing pain, hypotension, pulse deficit, neurologic deficit, new murmur) should be considered high risk for acute aortic dissection (AAD). That is the finding of a study to be published in the April 2018 issue of Academic Emergency Medicine (AEM), a journal of the Society for Academic Emergency Medicine (SAEM). The lead author of the study is Dr. Robert Ohle, MSc, MA, MB, FRCPC, Department of Emergency Medicine, the Ottawa Hospital Research Institute, University of Ottawa, Ottawa, Ontario. The study by Ohle, et al, further found that patients with no high-risk and multiple low-risk features (absence of abrupt-onset pain, history of ischemic heart disease and diabetes) are at low risk for acute aortic dissection. A novel finding of the study was that a history of ischemic heart disease decreased the probability of AAD. The study suggested that educational strategies focusing on disseminating the diagnostic accuracy of clinical findings could reduce time to diagnosis and that further research should focus on the ability of a combination of these factors in the assessment of a patient for AAD. The findings support the need for prospective data collection to address the reproducibility of subjective historical features and the accuracy of D-dimer in a lower-risk population. "Ohle et al have done a great job at telling us how acute aortic dissection presents to emergency departments. Are we finally on the verge of a decision rule for this disease that improves our miss rate without ballooning non-therapeutic imaging and costs? This study is a step in the right direction and the authors are in a good position to find the right balance of improved accuracy and increased cost."